The brand new Hotel Marmore has an ideal location on the main street in the village centre of Cervinia, only 200m from the Cretaz lifts and where, in normal snow conditions, you can ski to within 70m of the door. The hotel is built in a rustic Aosta-style that creates a cosy and friendly ambiance. The rustic Aosta-style creates a cosy and friendly ambiance. Rooms offer views of the village against the backdrop of the surrounding mountains. Rooms offer views of the village against the backdrop of the surrounding mountains and most of the rooms are equipped with a balcony and you will sleep well in exclusive beds. The restaurant of Hotel Marmore is located on the entrance floor and serve locally produced Italian food and wines from Aosta and Piemonte. Learn more about the history of Hotel Marmore starting with Mario Germano, a Piemontese young workman moving to Cervinia with his wife Ivonne Maquignaz. The Breuil-Cervinia Valtournenche Zermatt area is not only one of the largest in the Alps, it is also the highest, with the world's highest-lying cabin; Klein Matterhorn at 3.883 meters above sea level. Send in your application here! 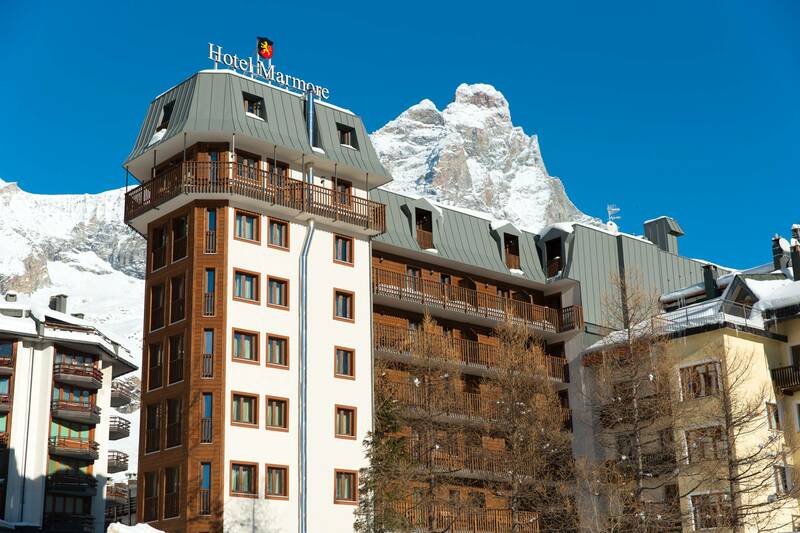 Hotel Marmore *** is located on the main street in the village centre of Cervinia, only 200m from the Cretaz lifts and where, in normal snow conditions, you can ski to within 70m of the door. The hotel is built in a rustic Aosta-style that creates a cosy and friendly ambiance. Next to the reception there is a nice bar and an excellent restaurant serving Italian specialties.